The Murderer's High-Five 'Let None Who Oppose Us Stay Alive'! “Oh, Vlad, my friend. We are making Bully Boy Autocratic History ! 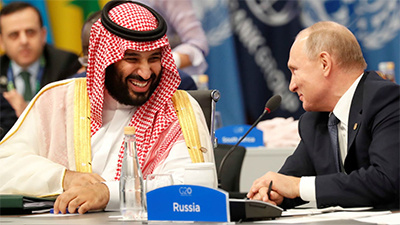 Give me the Autocratic Bad Boy’s Murderer’s Club High Five, my Man !” MBS said with a Batman movie Joker’s Big Grin as he slapped and grabbed Putin’s hand. “Yes, when, my Comrade in Arms ?” MBS hissed. “Yes, Trumpty is trying to manipulate his Base, the American Congress and the Free Press as best he can. He is leading a fairly effective smear campaign against the Journalists and News Media in general, and helping to weaken the Pillars and Institutions of the American Democracy with his Tweets and Rallies and slowly revealed Con Jobs and Bad Actions, but he cannot freely Murder those who Oppose him as we can,” MBS commiserated. “Truly, MBS, I snap my fingers or lift my eyebrow, and those who write things about me I don’t like or who oppose me in any other way, are Dead Meat, so to speak,” Putin said as he snapped his fingers and raised his eyebrow meaningfully. “Too bad he cannot Meet with us Privately at this G20 Summit without causing a Scandal. He is missing out on all of this delightful gloating over the rightness of our Bad Boy Badness, which we call Strength and Decisiveness, while others call our Autocratic Bad Boy’s Murderer’s Club nothing but Arrogant, Lawless, DisOrderly, Wicked Mis-Conduct,” MBS laughed heartily. “A splendid idea, my friend. Practice makes Perfect,” MBS replied as both Autocrats slapped one another’s backs amicably, and headed back toward the crowded room, staged microphones and the Press Corps laughing like prowling jackals.